The wheelbarrow, today used by construction workers and gardeners alike, is an indispensable invention. It allows us to move and deposit heavy loose loads with ease. The concept of a one-wheeled cart that can be propelled by one person has changed little in its 2,000-year history. The word wheelbarrow has been in the English language since the 14th century, and comes from the old English word “bearwe." A barrow (without a wheel) was similar to a stretcher, giving two people the ability to carry a load. The wheelbarrow was a technological advance in that it allowed one person to move a heavy load on his own. Putting sides on the wheelbarrow also allowed a single person to move loose or liquid loads without fear of dropping or spilling. The oldest surviving picture of a wheelbarrow, in a frieze-relief in a Chinese tomb, dates to the first century. The first Chinese wheelbarrows were large, and the axle was more centered than on our wheelbarrows today. This meant they could carry heavier, larger loads, and even people. As the use of wheelbarrows spread throughout China, they were generally powered by humans or animals, but an attempt was made in the 5th century to power one with a kite, says ChinaCulture.org. Wheelbarrows are still commonly used in rural areas of China. Evidence of wheelbarrows in Europe is documented in France’s Chartres Cathedral, where a wheelbarrow can be found depicted in a stained glass window which dates to the year 1220. A medieval manuscript from 1286 also shows a wheelbarrow, much longer and more curved than a modern one. 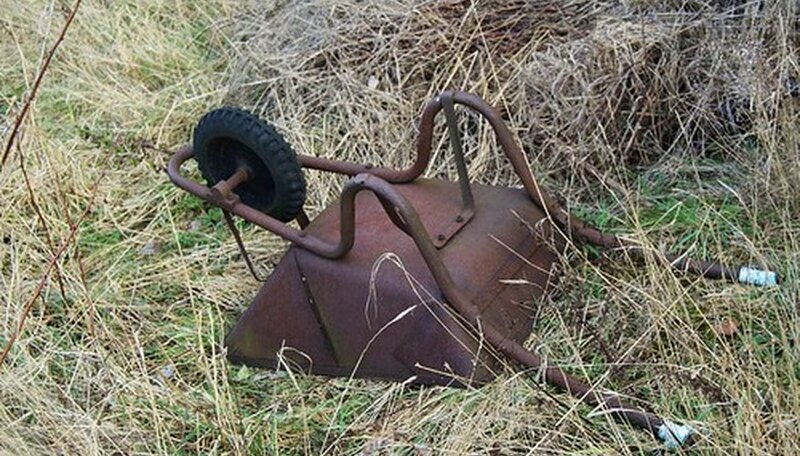 Unlike the early Chinese wheelbarrows, the wheel on the European wheelbarrow was moved closer to the front of the device. This gave the operator more leverage to handle a heavier load alone. Wheelbarrows came to the United States with the settlers, and played an important role in building the new country. Some men even attempted to push their belongings cross-country in a wheelbarrow on their way to the California Gold Rush A man named J.M. Studebaker did become wealthy in California, not by finding gold, but by making and selling wheelbarrows, according to the Sierra Nevada Virtual Museum. Nicknamed “Wheelbarrow Johnny," he eventually went on to found the Studebaker Corporation, producing some of the country’s first automobiles. Lightweight aluminum or plastic wheelbarrows are available for basic gardening tasks. Nurseries or professional gardeners require more durable steel models with pneumatic tires for easier maneuvering. New innovations include folding wheelbarrows which collapse for easy storage, and power-assisted wheelbarrows. How Durable Is an Earthquake Tiller?